This is an extraordinary place. There's magic in our energy, our spaces, our people and our discoveries. There's even magic in our motivation: to eradicate childhood disease, so that one day, like magic, children will no longer need us. Need to check a symptom or find a location nearby? We have the tools to get care now. Browse and connect with world-class pediatric specialists. Access your hospital bill, or search for insurance information. 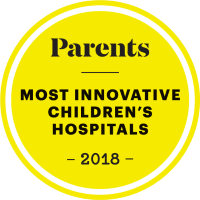 Because we see more and treat more children than any other hospital in the region, our unparalleled care leads to outcomes among the best in the country. Parents and caregivers know their child best, which is why you are the most important member of your child’s care team. Red wagons in our halls, prescription pets rounding the floors and a lounge just for teens – it all helps put our patients at ease and create a supportive space just for them. We understand that time is of the essence when your little one is sick. Instead of numerous appointments with different doctors, we coordinate your child’s appointments with all our specialists in one day. Need to talk with a pediatric nurse? Call our free ParentSmart HealthlineTM. We're available 24/7 to answer your health questions. Do you need urgent or emergency care? Choose the right type of care in the heat of the moment. We answer top questions from parents every month so you can stay up-to-date on ways to get well and stay well. To provide education and hope, we've connected families with a new diagnosis to families who have been through the journey. We know learning about real families' experiences is extremely important. Explore our library of patient stories. We're pairing families who received a new diagnosis, with families who have been through the journey. Garrison runs circles around bone cancer. With continued support and advanced 3D Motion Technology from our Gait and Movement Analysis Center, Garrison can keep chasing his dreams all the way to the Paralympic Games. Virtual reality is more than fun. It also has legitimate medical purposes. Here, our Extended Reality team is exploring new applications for the technology, from creative distraction to procedure prep. Use our tool to better understand what your child's medical symptoms could mean. In it's life-threatening, find the emergency location nearest you. For non-life threatening medical needs, search for the nearest urgent care locations. Not sure? Choose the right type of care in the heat of the moment.